To help women raising school-age children in fulfilling their dream of earning a college degree, while creating the desire, expectation, and priority of a college education for their children to follow in their footsteps. 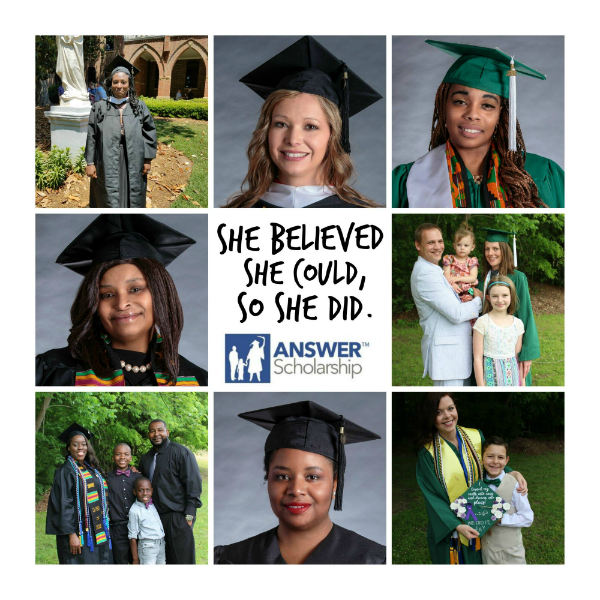 ANSWER has funded 115 college scholarships to 65 local moms since our founding in 2006. We’ve helped remarkable mothers in the Charlotte region earn college degrees and become strong and self-sufficient. Their children are inspired to follow their moms’ example and work harder in school. ANSWER scholars have an 80 percent graduation rate, compared to the national graduation rate of 39 percent for non-traditional students. Our scholars have graduated from UNC Charlotte, Winthrop University, Johnson C. Smith University, and many other colleges and universities. Some scholars have gone on to earn master’s degrees. All are prepared to develop careers in the fields of their choice. We are proud to influence economic and social mobility in our community by helping to educate one mother at a time.